Fundação O Século i Cascais, Portugal: Reservér nu! 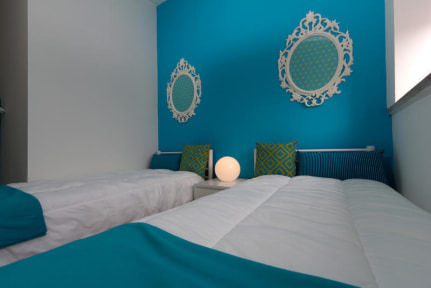 Turismo Social -Fundação O Seculo provides affordable accommodation, just a 20-minute drive from the Lisbon city centre. The Estoril centre is a 5-minute drive while the São Pedro do Estoril Train Station is a 5-minute walk away. O Seculo features accommodation in twin rooms, some with a private bathroom and other with access to shared bathroom facilities. The rooms at the property were all decorated by a team of 17 designers and artists who dedicated themselves to customizing each room. The units feature a balcony, patio and cable TV. Guests are welcome to try traditional Portuguese meals in the Seculo’s in-house restaurant. Breakfast is included in the room rate and served each morning in the dining area. The Lisbon International Airport is a 25-minute drive away from the property.